Happy Tuesday! Today is a short post just because I’m a bit overwhelmed with schoolwork tonight. But, I’m excited to finally be sharing this tiered off the shoulder top! I am so in love with it and have worn it so many times already. The color is perfect and I love the tiered details. I also love that it’s blush. I paired it with a comfortable pair of heeled sandals (highly recommend them) and my favorite choker necklace that I recently picked up in black! I’m trying to enjoy the last few days of white jean season. Also, my big blog redesign project starts today and the new site will launch on Sept. 24! I’m so excited! Just love that blush top! And that necklace!! These colors are PERF together! Cute top! Love the color of that bag too. Obsessed with that top! Blush and white is my fav color combo!! This top is GORG! I am loving this whole look! Prettiest outfit ever! Love your bag! Thank you! I’ve actually considered selling it but my mom won’t let me.. I love it, too, but it can get scratched easily! This look is right up my alley!!! So cute! Love the ruffles on the top and your hair looks gorgeous!!! It SO is up your alley! And thank you! I want it to grow longer!!! Gorgeous Lauren! Love the top and shoes! Can’t wait to see your new design! Thank you! I’m so excited! I got some mood boards and first round of logos today! I can’t wait!! Love this off the shoulder top! Such a cute look! Thanks so much, pretty girl!! This is such a gorgeous color on you – I love all of the soft tones and accessories you paired it with! Thank you so much! 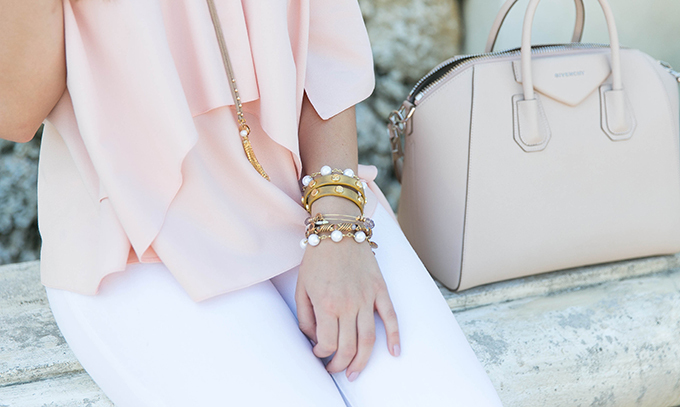 You can never go wrong with neutral accessories! Such a beauty! This top is perfect on you, & love it with that lariat choker! Thank you so much! I love this choker from taudrey! Oh I love this top! I’m obsessed with pretty much anything blush colored these days and pairing it with white is such a pretty combination. I love OTS I think it is here to stay, so pretty. I agree! And I am so happy about it! Beautiful outfit! I love the top. This top is BEAUTIFUL! Love it paired with your white jeans and neutral bag and shoes! The top looks so pretty on you! Have a lovely rest of your week! Thank you, beautiful! You too!!! I love this top, I love the pink and white it’s so bright and fresh. You look so glam!!! I adore this shade of pink – so cute! You are so gorgeous! How did I not find you earlier?! Love your style and photos!